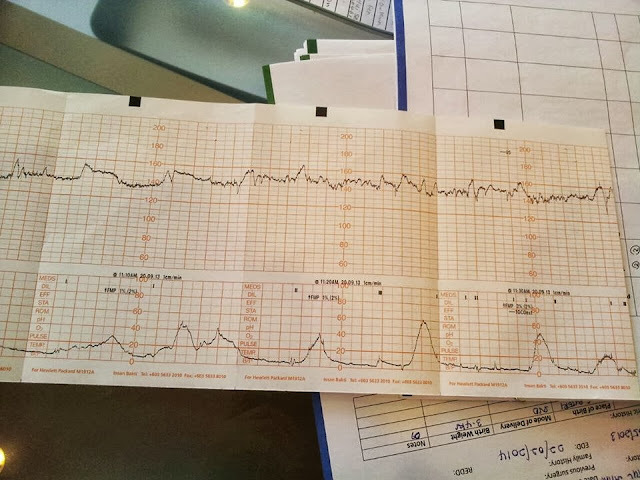 " In medicine (obstetrics), cardiotocography (CTG) is a technical means of recording (-graphy) the fetal heartbeat (cardio-) and the uterinecontractions (-toco-) during pregnancy, typically in the third trimester. 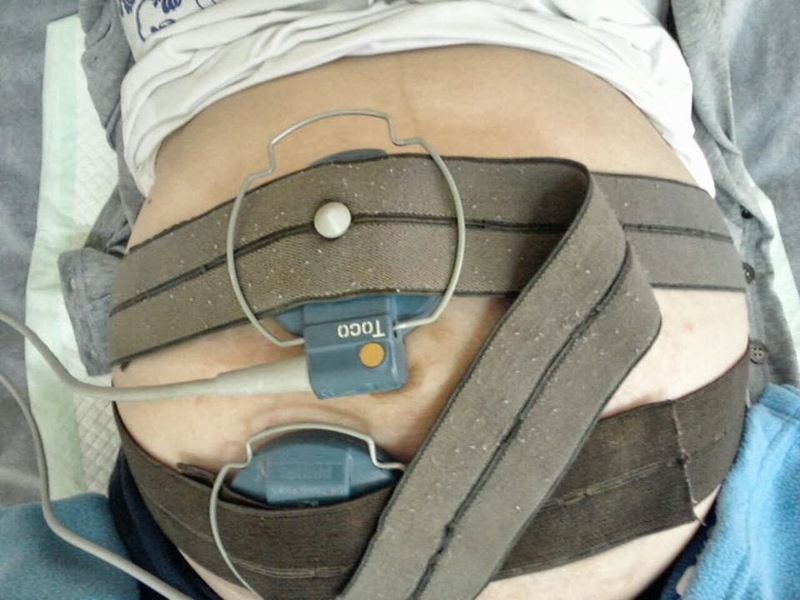 The machine used to perform the monitoring is called a cardiotocograph, more commonly known as an electronic fetal monitor (EFM). Toward the end of my pregnancy now.. Today exactly at 40 weeks which is my "Estimated Due Date" (EDD).. but my baby still not ready to come out yet.. so what's my doctor asking me to do is to trace baby activities and heartbeat by doing CTG or EFM for 30 mins.. Today is the 2nd time I did this monitoring.. the 1st one was on 18 September 2013. and the reading and the graphs actually telling me and doctor that my baby is healthy!!! This actually giving me some kind of comfort that baby is doing well inside there.. however, I was also in doubt is this really necessary?? because as mother ourselves we can actually feel and tell if our baby is good or not by feeling their movement.. is their movement regular and normal as normal days.. but somehow doctor can't know it.. so they need this kind of device to tell them if the baby is doing good or not..
Again tomorrow I need to do this CTG again.. doctor is a bit caution as I progress over the so called "EDD" but according to WHO - any pregnant mummy "gestation delivery dates can fall in between 38 weeks to 42 weeks" so actually I am still within the range.. Just wonder why doctor so gan cheong!!! (yeah!! i am much calmer in this pregnancy actually!!) Maybe because I have already equipped myself with the knowledge I need to know about birthing and also attended the hynobirthing class... with the knowledge I had.. I really feel I am more in control and I am calmer and not easily panic over whatever doctor tell..
me.. my belly and my baby..
the graph.. heartbeat of baby is the upper one.. which all in between 140 - 160... which is very good and healthy.. and bottom is the surges trace.. that tell the nurse or doctor how pain is it the mummy in labour.. and how frequent its happened!! yeah I have quite a lot surges happening for the past 1-2 weeks already.. but still not the time yet.. Hey!! my baby Zoe.. mummy is waiting for your decision as when you decide to come out.. please help giving mummy more surges and more and more surges that bring you to mummy.. we can do it naturally my dear baby.. pls help mummy!! !